Oil sands slurry produced in the Slurry Preparation Plant (SPP) contains about 50-55% sand and less than 10% bitumen. The purpose of Extraction is to recover the bitumen portion, while rejecting the heavy solids. This is achieved through a simple water-based gravity separation process, most of which occurs in a single large cone-bottomed vessel. The bitumen attaches to free air bubbles and rises to the top of the vessel, forming an intermediate froth product. The heavy sand sinks to the bottom and is pumped out to the tailings plant. reject as much of the solids as possible to the tailings plant. In order to recover the bitumen droplets, the bitumen must first be liberated from the sand grain. Once liberated (which mostly occurs during Hydrotransport), the hydrophobic (water-fearing) bitumen will seek to attach itself to any free air bubbles. This aerated bitumen droplet is relatively light and will float to the top of the gravity separation vessel. The coarse sand particles contained in the slurry are heavy and will immediately sink to the bottom. This large difference in density is why gravity separation works so well for recovering bitumen from mined oil sands. a secondary recovery circuit where bitumen is recovered from the middlings stream, typically consisting of several flotation cells. Underflow: a coarse tailings stream consisting of at least 50% solids and residual bitumen (typically <1%). Only the main gravity separation vessel produces a final product, which is pumped to Froth Treatment for further cleaning. Middlings circuits provide secondary bitumen recovery, where the low quality bitumen froth produced by the flotation cells is recycled back into the main vessel. Some operators also have a tertiary bitumen recovery circuit, where bitumen is recovered from the tailings (underflow) of the main gravity separation vessel. As in the case of middlings recovery, bitumen is recovered using a series of flotation cells. This low quality froth is recycled back to the main gravity separation vessel for final clean up. Gravity separation cells are large diameter cone-bottomed vessels with a steep side slope. The shape of the vessel facilitates the separation of heavy solids from the light, aerated bitumen froth. 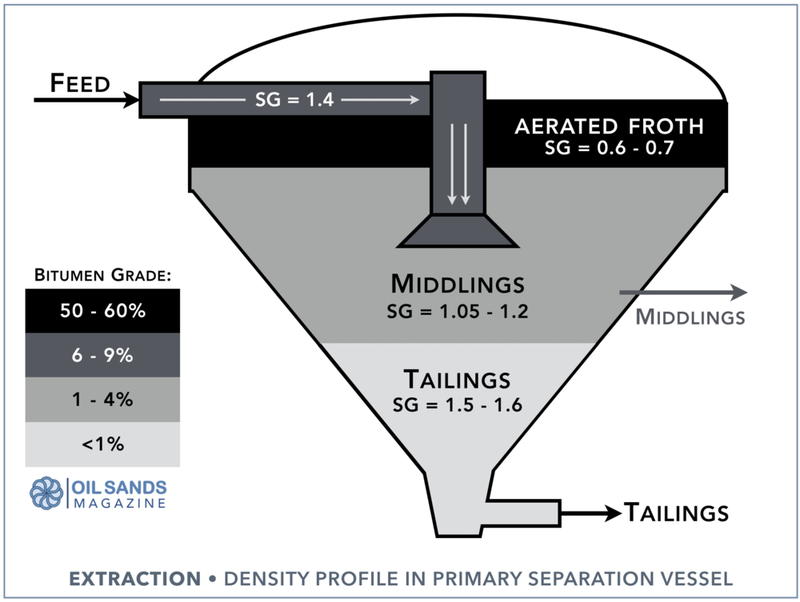 Oil sands slurry from the Hydrotransport pipeline enters the vessels through a feedwell, which evenly distributes the slurry below the froth layer. 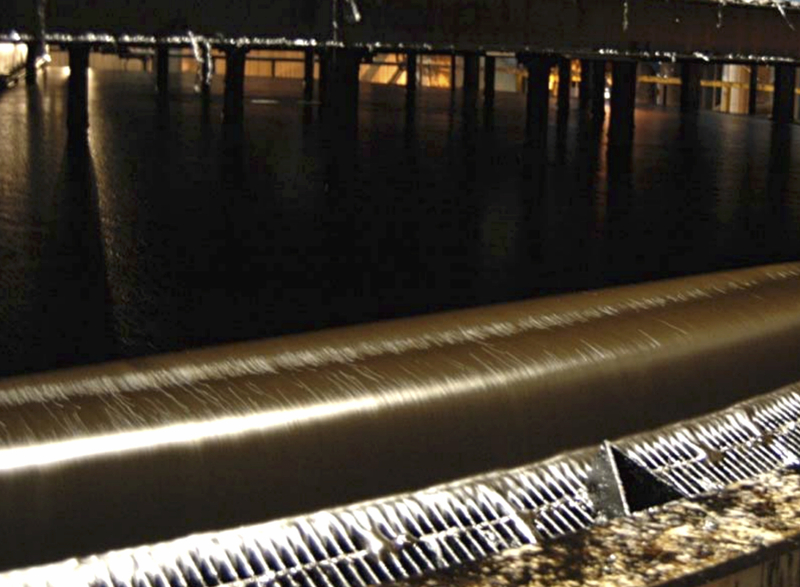 Hydrotransport feed normally has a density of 1.50 to 1.58 t/m³ and a bitumen content of approximately 8%. In order to improve settling, the feed is typically diluted to a density closer to 1.4 t/m³ before it enters the vessel. Once the diluted slurry enters the vessel, the buoyant, aerated bitumen instantly floats to the top. This intermediate froth product overflows into a froth launder, which gravity flows to a downstream deaeration unit. Aerated bitumen has a very low density (normally much less than 1) due to its very high air content. Coarse solids sink to the bottom of the vessel and are pumped out to the tailings plant (sometimes referred to as PSC underflow). The coarser the solids, the faster they settle and the higher the underflow density. A low underflow density is indicative of poor settling in the vessel and often warns of low bitumen recovery rates. Underflow densities never exceed 1.6 t/m³ since this is the maximum density slurry that can be handled by a centrifugal pump. Anything higher than 1.6 t/m³ (greater than 65% solids) will likely lead to plugging of the cone section of the vessel. The slurry which lingers in the middle of the vessel (termed middlings) is made up of material not heavy enough to sink and not light enough to float. Middlings typically have a higher bitumen content than the underflow (normally 1 to 4%) and a density range of 1.05 to 1.20 t/m³. This material is often reprocessed in aerated flotation units due to its significant bitumen content. Middlings are typically comprised of fine solids and clays, which trap the bitumen and hinder attachment to air bubbles. Middlings with a high density tend to also have a high bitumen content and lots of fine clays. Conversely, middlings that have a low density normally contain very little bitumen and fewer fines. Most of the solids contained in the oil sands deposit are quartz, or silica sand (SiO₂). Particles larger than 44 µm (microns) in diameter are considered coarse, while those less than 44 µm are considered fine. Contained within the fines fraction are clays, which are defined as fines less than 2 µm in size. Clays found in oil sands deposits are mostly kaolinite and illite but can also contain fractional amounts of chlorite, smectite, feldspar and montmorillonite. These clays have a flat, plate-like shape. 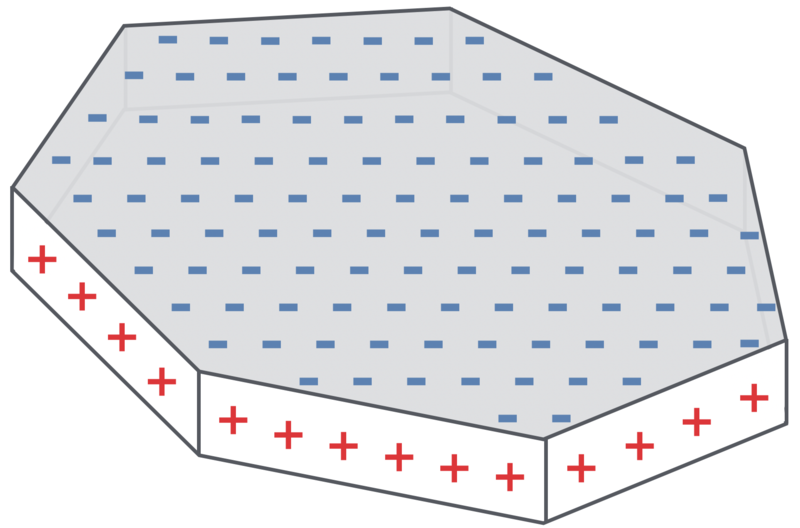 The face of the plate is negatively charged while the edges of the plates are positively charged. Bitumen is normally negatively charged due to the presence of surfactants which naturally reside on the surface. These negative ions make the bitumen naturally hydrophobic (water-fearing), encouraging attachment to free air bubbles. However, when clays are present in the slurry, the positive edge of the clay plates attach to the negatively charged bitumen, neutralizing the surface charge of the bitumen. A bitumen particle fully engulfed in clays therefore cannot not attach to a free air bubble. These non-aerated, clay-contaminated bitumen droplets have a density greater than 1.0 and will not rise to the top of the gravity separation vessel. Since these particles are also not very heavy, they also don’t sink very easily and have a tendency to linger in the middle of the vessel. These “middlings” are commonly withdrawn from the gravity separation vessel and reprocessed in highly aerated flotation cells in order to help recover the trapped bitumen. The amount of clays contained in an oil sands deposit is proportional to the amount of fines. Therefore, all high-fines ores have a high clay content and tend to have a lower bitumen content. These lower grade ores are often termed “poorly processing” since they disrupt the gravity separation process in Extraction. Bitumen froth produced from high-fines ores tend to be of a lower quality, typically containing less than 50% bitumen and more than 40% water. Fines are defined as all solid particles smaller than 44 μm in diameter. Clays are those fines which are less than 2 μm in size, sometimes referred to as ultra fines. Clays found in oil sands deposits are mostly comprised of kaolinite and illite. So all clays are fines but not all fines are clays! Extraction Plant performance is measured by (1) the quality of the froth produced, and (2) the fraction of bitumen recovered. Froth quality is a very important performance metric for any oil sands Extraction plant. There are 3 components found in bitumen froth: (1) bitumen, (2) fine solids and (3) water. 1. Bitumen Grade: Froth quality is measured by the bitumen grade (or content) of the froth. A froth containing 55-60% bitumen is considered good quality. Anything below 50% is considered poor or low quality froth. Grades approaching 60% are very high quality. The theoretical maximum grade of bitumen froth is about 65%. 2. Solids Content: The solids content of bitumen froth actually does not vary much. Solids content can be as low as 8 or 9% but theoretically not much lower. A typical froth contains 10 to 13% fines. A very low quality froth can have as much as 15% fines. 3. Water Content: The major difference between a low quality and a high quality froth is mostly water content. A good quality froth normally contains about 30% water. A low quality froth has more than 40% water. A majority of the solids found in the oil sands deposits are water-wet, meaning they have a tendacy to stay with the water phase and can settle out during the Extraction process, given enough time. However, some fraction of the fine solids are oil-wet, meaning they have a tendancy to stay with the bitumen and will never settle-out in Extraction, no matter how long the residence time. That's why bitumen froth always contains at least 10% solids. Without the use of chemical aids or hydrocarbon solvents, it is almost impossible to remove all fines from the bitumen froth in a water-based gravity separation process. Low quality oil sands feed from the mine normally has a high concentration of fines/clays and less bitumen. The high clay content affects the ability of the bitumen droplets to attach to air bubbles, therefore reducing bitumen recovery. 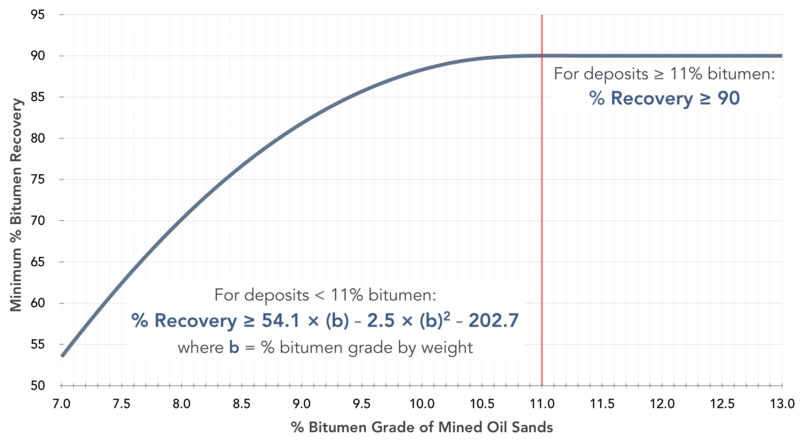 When processing a low quality (high fines) oil sands deposit, a lower quality froth is normally produced with a significant fraction of the bitumen being lost to the tailings and middlings streams. Low quality ores can result in bitumen recovery rates as low as 60% within Extraction. 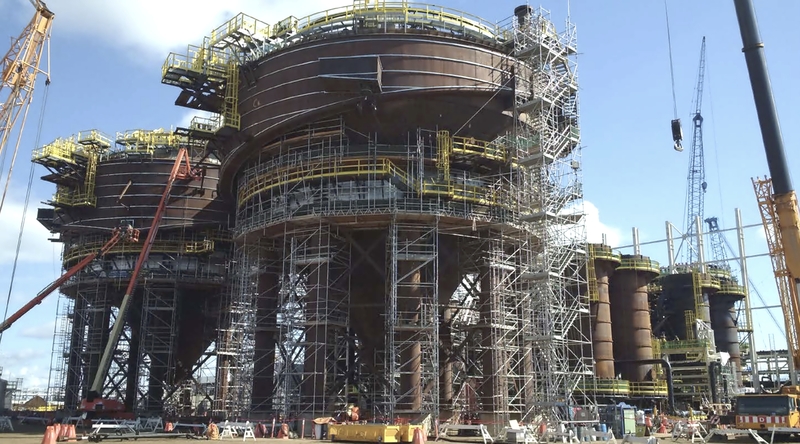 Each Extraction plant is designed for a certain oil sands throughput assuming an average ore grade. If an excessive amount of oil sands is processed through the Extraction plant (above the design capacity), the residence time within the gravity separation vessel is proportionally reduced and bitumen recovery rates may be compromised. This is especially a problem when processing lower-grade ores, which have a higher fines content, requiring more dilution and a lower throughput rate. Very high grade deposits can also be problematic since the gravity separation vessel can develop a very deep froth layer and more residence time is required to recover all the bitumen. Whenever process upsets occur in Extraction (poor quality froth and low recovery rates), reducing throughput and increasing water dilution is a good way to help the process recover. Process temperature is one of the most important operating variables affecting bitumen recovery. At low temperatures (below 40ºC), the bitumen viscosity is high and attachment to air bubbles is very weak. However, as the temperature increases above 50ºC, the bitumen viscosity is reduced and approaches the viscosity of water. This enables the bitumen to envelope the air bubble and provides far more stable attachment. Bitumen recovery rates are therefore greatly improved at higher operating temperatures. However, the effect is far more pronounced when processing low-quality ores. If the ore quality is good, then bitumen recovery is generally quite good regardless of process temperature. If the feed quality is poor (low grade, high fines) then a lower operating temperature greatly hinders bitumen recovery. The minimum recommended operating temperature is 35ºC regardless of the quality of the oil sands deposit. There is little improvement in recovery observed above 50ºC. In other words, operating at 70ºC does not offer better performance than 50ºC. This is due to the fact that the viscosity of bitumen is very high at low temperatures (> 10,000 cp), drops below 1,000 cp at 50ºC and then begins to level off. Bitumen attachment therefore does not improve at very high operating temperatures. Bitumen froth produced in Extraction is an intermediate product that undergoes further cleaning in the downstream Froth Treatment plant. During Froth Treatment, a light hydrocarbon is added to the froth, greatly reducing its viscosity which settles out all remaining fines and water. If the froth is very low quality (containing lots of fines and water), Froth Treatment becomes constrained in its capacity, slowing down the production of clean bitumen. While the specifications for bitumen froth is quite wide, diluted bitumen is a final product which feeds into an upgrader or refinery, and therefore has much tighter quality specifications. Therefore, the quality of froth produced in Extaction is very important to the performance of the overall facility. A minimum recovery of 90% is required for deposits containing at least 11% bitumen. Bitumen recovery is defined as the mass of bitumen in the final product divided by the total amount of bitumen sent to the process plant. The purpose of Directive 082 is to encourage conservation and prevent waste of the oil sands resource. Operators that do not achieve the minimum recovery rates are required to put forward a mitigation plan to improve recovery. Operators are also required to demonstrate that they have sufficient measurement systems in place to measure bitumen recovery to within an accuracy of 1%. Note that this curve applies to the overall Bitumen Production facility, excluding asphaltene losses within Froth Treatment. Losses in Ore Preparation and Froth Treatment tend to be a function of plant design, and therefore do not vary much. However, losses within Extraction are a function of the quality of the mined oil sands and plant performance, which can therefore vary greatly. Also note that these recovery rates only apply to mining facilities, not in-situ which have much lower recovery rates. Mine operators are only required to process deposits containing more than 7% bitumen, defined as the “cut-off grade”. Anything below 7% can still be put through the process plant at the operator's discretion. DID YOU KNOW? Accumulation of salt ions is why the Extraction process prefers clean river water over recycled process water. In the absence of water treatment, continued recycling of process water can lead to the accumulation of high levels of Ca and Mg salts and chlorides, which are all very bad for the process plant. Despite the detrimental effects, over 80% of the process water used in the SPP and Extraction is recycled from the Tailings Pond. Although the shape and design of each gravity separation vessel is slightly different across the various operators, each vessel functions the same way and has similar design features. Froth produced by Primary Separation Cells is highly aerated, containing as much as 40% air bubbles by volume. Aerated froth cannot be pumped very easily and therefore undergoes a deaeration step before being pumped to a Froth Storage Tank. Froth deaerators are vertical columns equipped with internal trays or shed decks. Froth is gravity fed into the top of the column, flowing downwards through the trays. As the aerated froth spreads out across the trays, air bubbles "burst", reducing the air content. Most oil sands operators inject steam into the bottom of the deaerator, which flows upwards through the column. Steam heats the bitumen froth, reducing viscosity, which lowers the surface tension of the bitumen. This destabilized the air bubbles, providing both heating and deaeration. Once deaerated, the froth is pumped to a storage tank, which usually provides surge capacity and several hours of froth inventory for the downstream process plant. EXAMPLE OF A DEAERATOR COLUMN INSTALLATION AT FORT HILLS (UNDER CONSTRUCTION). SINGLE DEAERATOR RECEIVES FROTH FROM TWO ADJACENT PRIMARY SEPARATION CELLS. Once a bitumen froth is produced in Extraction, the quality is still too low to be processed by an upgrader or refinery. Bitumen froth still contains about 10 to 15% solids and up to 40% water, neither of which can be removed through water-based gravity separation. The only way to further clean Extraction froth is through the addition of a light hydrocarbon, which lowers the viscosity of the bitumen, releasing the fines and water, creating a clean diluted bitumen stream. This solvent-based gravity separation process is known as Froth Treatment.